Britain’s Telegraph reported on aerial footage from Friday showing that the storage pool containing the spent nuclear rods has boiled dry. This means the rods are overheating and breaking down. Due to the explosion at the building, it also means radiation is escaping into the atmosphere. There was a ray of hope in that a power line was being connected to reactor #2 in the hopes of restarting its cooling system however today, Saturday; it seems that is still not working. Wikipedia’s chart of the Fukushima reactors showing their status as of 22:00 on March 19, is listing each of reactors one, two, and three as having their fuel exposed. Workers are still trying to inject seawater into the cores but it is not known how well this is working. Kyodo news reported around 7pm local time that milk and spinach from areas around Fukushima have tested with radiation above Japan’s regulated standards. This was announced by Chief Cabinet Secretary Yukio Edano. He did go on to explain that the levels of radiation detected do not immediately pose a risk to human health. If the milk was consumed for a year at the average rate for Japanese people, the radiation level would be equivalent to a single CT scan, for the spinach it would be equivalent to a fifth of the level of a CT scan. The milk from the town of Kawamata in Fukushima Prefecture was collected between Wednesday and Friday, and the contaminated spinach, from six municipalities in Ibaraki Prefecture, was picked on Friday, according to the health ministry. Kyodo, in a separate article, stated that slight amounts of radioactive iodine have been detected in tap water in Tokyo, its vicinity and most prefectures neighbouring Fukushima. Once again, the government has said that these amounts do not affect human health even if they are taken in. The LA Times says that workers have managed to restore power to reactors number five and six and succeeded in getting their cooling systems operational. While #5 and #6 do not represent any rick, it is a promising step in being able to completely restore power at the plant so all reactor cooling systems can be brought back on-line. Nevertheless, the remain concerns that the explosions in the other reactor buildings may mean that cooling equipment is damaged and restoring power may turn out to be fruitless. Fukushima 50 is the name given to the employees of the Fukushima I Nuclear Power Plant who were assigned to remain on-site when a complete withdrawal proposed by TEPCO on 14 March 2011 was rejected by the prime minister, during the Fukushima I nuclear accidents to continue their attempts to bring the reactors under control. The original Fukushima 50 were joined by 120 extra workers in the following days and the Fukushima 50 has remained the name used by media to refer to the group of workers at Fukushima. The number of the worker became 580 on the morning of 18 March as the member of Kashiwazaki-Kariwa Nuclear Power Plant and workers who draw power line joined. Acknowledging their bravery, Japanese Prime Minister Naoto Kan, said: “You are the only ones who can resolve a crisis. Retreat is unthinkable.” prior to the workers and volunteers being assigned the mission of stabilising the reactors. They are likely older workers, unlikely to have children, so the long-term effects of exposure to high-levels of ionizing radiation would be less likely to appear before a natural death. Over 20 workers had injured by 18 March, including one who was exposed to lots of Ionizing radiation when the worker tried to vent vapour from a valve of Containment building. The international limit for radiation exposure for nuclear workers is 20 mSv per year, averaged over five years, with a limit of 50 mSv in any one year. On the morning of Tuesday 15 March 2011, radiation rose to approximately 1000 millisieverts (or 1 sievert) per hour for a brief time, the highest level of radiation detected at any point of time during the accident at the plant. Reuters has summarized the tragedy in some pertinent and telling numbers. The official count stands at 7,653 dead which exceeds the 6,434 who died in the Kobe quake of 1995. Another 11,746 are missing and the final death toll is expected to exceed ten thousand. The evacuation area around Fukushima nuclear plant is 20 km (12 miles). A total of 362,000 people are living in shelters. Anybody within 30 km has been told to stay indoors. About 256,819 households in the north are without electricity. At least 1.04 million households in 11 prefectures are without running water. Estimates on the total cost of damages in this disaster vary from $150 billion to $200 billion. The nuclear crisis in Japan is spreading with signs of radioactive contamination in food and drinking water in Tokyo. At the source of the crisis – one of the damaged reactors at the Fukushima has been stabilised. Japan held a moment of silence marking one week since an earthquake and tsunami shattered the country’s northeastern coast. 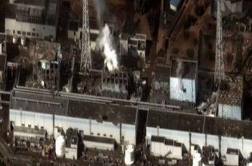 Engineers at the damaged Fukushima nuclear power hooked up a new power cable hoping to revive the cooling system.